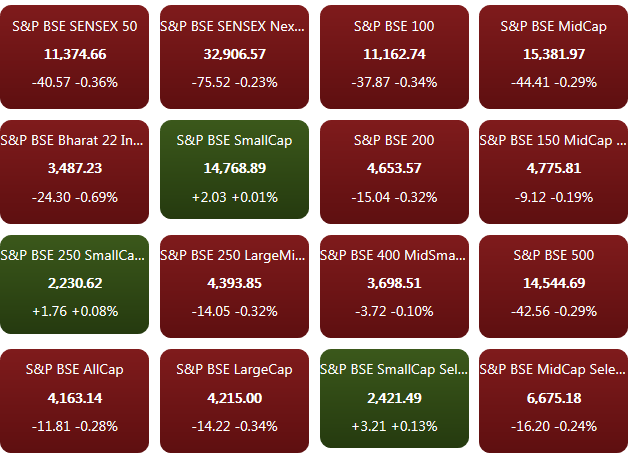 Share market HIGHLIGHTS: BSE Sensex on Wednesday ended the session falling more than 350 points and NSE Nifty plunged below the 10,900-mark on the selloff in metal and auto stocks on account of weak Asian markets. 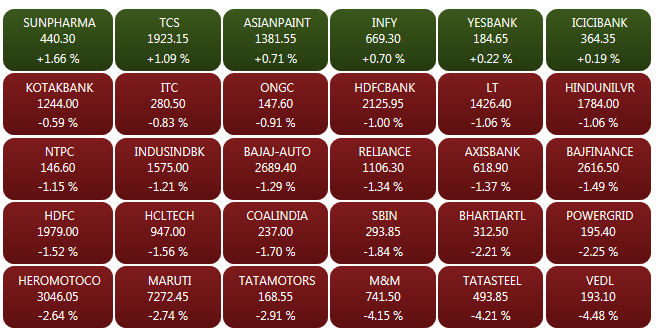 Share market HIGHLIGHTS: The NSE Nifty fell by 116 points, or 1.06 per cent, to 10,794. Share market HIGHLIGHTS: BSE Sensex on Wednesday ended the session falling more than 350 points and NSE Nifty plunged below the 10,900-mark on the selloff in metal and auto stocks on account of weak Asian markets. At the close of market hours, the Sensex was down 363.05 points or 1.00% at 35891.52, while the Nifty down 117.60 points or 1.08% at 10792.50. Disappointing Chinese economic data and weak auto sales number played out as dominant factors in triggering sell-offs in metal and auto stocks on domestic bourses. Among the major gainers on BSE Sensex were Sun Pharma, TCS and Vedanta, M&M, Eicher Motors and JSW Steel emerged as top laggards. Meanwhile, on Tuesday, the 30-share Sensex ended 186.24 points higher to 36,254.57, while the Nifty zoomed past the 10,900-mark. Bharti Airtel share price ended the session 2.7% higher to 312.55, while HDFC share price gained by more than 1.9% to Rs 2,008. Yes Bank share price zoomed more than 2% to hit the day’s high at Rs 185.90. Market breadth in favour of declines with advance-decline ratio at 1:2. 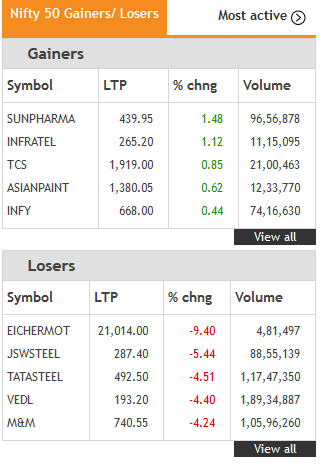 Autos and metals were the top losers on the Nifty. 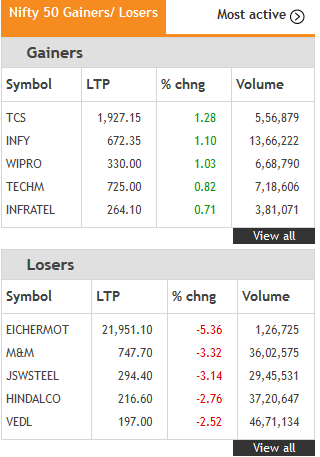 Eicher & JSW Steel lead losses. Nifty metal emerges as the worst sectoral performer. Gold prices edged up by Rs 30 to Rs 32,500 per 10 gram at the bullion market here Wednesday due to a firm trend overseas, PTI reported. Similarly, silver gained Rs 100 to Rs 39,350 per kg on increased demand from industrial units and coin makers. The oil marketing firms trim losses following a Reuters report that state-owned fuel retailers have stopped absorbing government-mandated cut of 1 rupee (0.014 U.S. cents) a litre in their marketing margins on sale of petrol and diesel. The direct tax-to-GDP ratio of 5.98 per cent achieved during 2017-18 fiscal is the best in the last 10 years, the finance ministry said Wednesday. In its 2018 review said, the ministry said: "There is a constant growth in direct tax-GDP ratio over last three years and the ratio of 5.98 per cent in Fiscal Year 2017-18 is the best DT-GDP ratio in last 10 years", PTI reported. The Indian economy is projected to be the fastest-growing major economy in the current and upcoming fiscal 2019-20, the finance ministry said Wednesday while emphasising that the government has taken several steps to boost investors' confidence, PTI reported. Tata Cleantech Capital (TCCL), a joint venture between Tata Capital and the International Finance Corporation (IFC), Wednesday said it has raised Rs 180 crore through its maiden five-year green bond from Netherlands-based development bank, FMO, PTI reported. Iran is keen to invest in the Rs 35,700-crore expansion of Chennai refinery irrespective of economic sanctions imposed by the US against the Persian Gulf nation, PTI reported citing IOC Chairman Sanjiv Singh on Wednesday. Jet Airways on Wednesday said in a regulatory filing that its short term rating has been revised to 'D' from 'C'. The downgrade ahs considered a delay in payment of interest, principal installment due by December 31. The next GST Council is scheduled to meet on January 10 this year to consider lowering GST on under-construction flats and houses to 5 per cent, as well as increasing exemption threshold for small and medium enterprises, PTI reported. As participants expanded their positions on rising demand in the sport market, chana prices surged 0.14 per cent to Rs 4,315 per quintal in futures trade Wednesday. At the National Commodity and Derivatives Exchange, chana for delivery in February was trading higher by Rs 6, or 0.14 per cent, to Rs 4,315 per quintal with an open interest of 35,600 lots, PTI reported. Starting 2019 on a bearish note, China stocks closed lower on Wednesday, as weak economic data stoked worries about a global slowdown. The blue-chip CSI300 index fell 1.4 percent to 2,969.54 points, while the Shanghai Composite Index ended down 1.1 percent at 2,465.29 points. Shares of Jet Airways plunged more than 3 per cent after the private air carrier said it had defaulted on loan repayment to banks. The stock fell 3.39 per cent to Rs 271.50 on BSE. On NSE, shares of the company fell 3.13 per cent to Rs 272. Nifty Auto index drops as much as 1.7% in its worst intraday fall since December 21. The shares of Eicher Motors slipped as much as 6.8% after it posted a 13% drop in December Motorcycles sales on Tuesday. The shares of Tata Motors were down as much as 2.3%. Australian stock market closed lower on Wednesday on the first trading day of the year as a disappointing Chinese manufacturing survey raised concerns about the health of the world's second largest economy and Australia's largest trading partner. The manufacturing sector activity in the country grew at a slower pace in the month of December from an 11-month high of 54.0 in November, despite factories reducing their prices, PMI data showed on Wednesday. The Nikkei India Manufacturing Purchasing Managers’ Index, which is compiled by IHS Markit, fell to 53.2 from 54 in November. Gold prices Wednesday rose 0.07% to Rs 31,445 per 10 grams in futures trade as participants created fresh positions, tracking firm trend overseas. At the Multi Commodity Exchange, gold for delivery in February rose by Rs 23, or 0.07 per cent, to Rs 31,445 per 10 grams in a business turnover of 12,783 lots, PTI reported. Jet Airways today said it has defaulted on loan repayments to banks, according to an exchange filing. "Payment of interest and principal installment due to the consortium of Indian Banks (led by State Bank of India) on December 31, 2018 has been delayed due to temporary cashflow mismatch," the company said in a regulatory filing. Bajaj Auto Wednesday reported 18 per cent increase in total sales in December at 3,46,199 units as against 2,92,547 units in the same month previous year. Motorcycle sales grew 31% to 2,98,855 units in December 2018 against 2,28,762 units in December 2017, the company said in a BSE filing. Bank Of Baroda has said that All India Bank Of Baroda Employees' Co-Ordination Committee, Bank of Baroda Karmachari Sena would go on strike on January 7. In the event of this strike, functioning of different branches of the bank and administrative offices across the country may get affected. Indian Prime Minister Narendra Modi’s government missed a self-imposed target to electrify every home, delaying the success of a marquee $2.3 billion development goal that his party plans to showcase before national elections early this year. Foreign funds pulled out Rs 48.19 crore from the capital markets on a net basis, while domestic institutional investors bought shares worth Rs 142.58 crore Tuesday, provisional data showed. Elections and global factors such as crude oil shocks could add to stock market volatility in New Year 2019. In debt markets, the 10-year government bonds yields declined 0.20% to 7.40% from its previous close of 7.42%. Rupee opens lower at 69.52 aagainst the US Dollar. On Tuesday, the domestic currency closed at 69.44. Rupee is expected to witness a technical correction today and thus the trading range for the spot USD-INR pair would be 69.50-70 per US dollar, Pramit Brahmbhatt of Veractity told CNBC TV18. Asian shares turned tail on the first trading day of the new year as more disappointing economic data from China darkened the mood and erased early gains in U.S. stock futures MSCI's broadest index of Asia-Pacific shares outside Japan skidded 1.1 percent as a private survey showed China manufacturing activity contracted for the first time in 19 months. Oil markets reversed early gains on Wednesday to fall on the back of surging U.S. crude production and concerns of an economic slowdown in 2019.International Brent crude futures were at $53.65 per barrel at 0218 GMT, down 15 cents, or 0.3 percent, from their final close of 2018.West Texas Intermediate (WTI) spot crude oil futures were at $45.34 per barrel, down 7 cents, or 0.1 percent. Share market on Tuesday: The 30-share Sensex ended Tuesday 186.24 points higher to 36,254.57, while the Nifty zoomed past the 10,900-mark. Bharti Airtel share price ended the session 2.7% higher to 312.55, while HDFC share price gained by more than 1.9% to Rs 2,008. Yes Bank share price zoomed more than 2% to hit the day’s high at Rs 185.90.